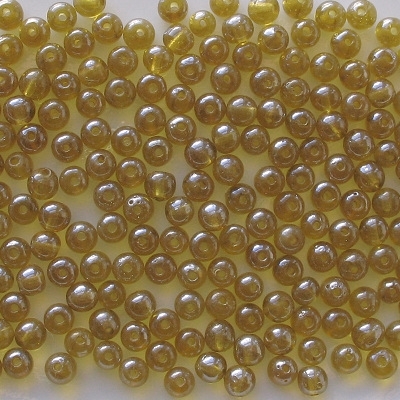 Translucent olive green with a luster coating. This olive green is more yellow than what I see from the Czech manufacturers. 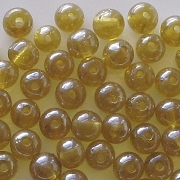 These are Indian beads, so the size may vary a bit from one to the next. However, they seem to be more consistent than other Indian beads I have carried. Also, I noticed that some beads have bubbles in the glass. 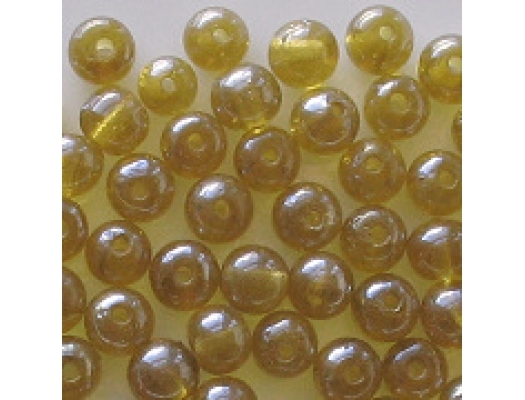 The color of these beads is a mixture between green and topaz; in other words, the green is more yellow than most other olive green beads I have carried. I've also noticed that in some kinds of light they look more topaz than in other kinds of light.